After another choppy ride in December, the domestic market retreated 0.7% and the foreign market MSCI EAFE index lost almost 3%. My benchmark index, which is composed of 50% domestic equity, 35% foreign equity and 15% cash, suffered 1.34%. Speaking of my portfolio, although I took some (more) beatings in my large bank and credit card company holdings, my other financial stocks and energy holding came to the rescue. Also, my hand-picked foreign equity funds are performing extremely well compared to the index. All together, my portfolio only took a small haircut of 0.52% in December, which is much better than the 1.34% loss of the index. Although extremely volatile in the latter half, 2007 is still a good year for investors committed to the market. 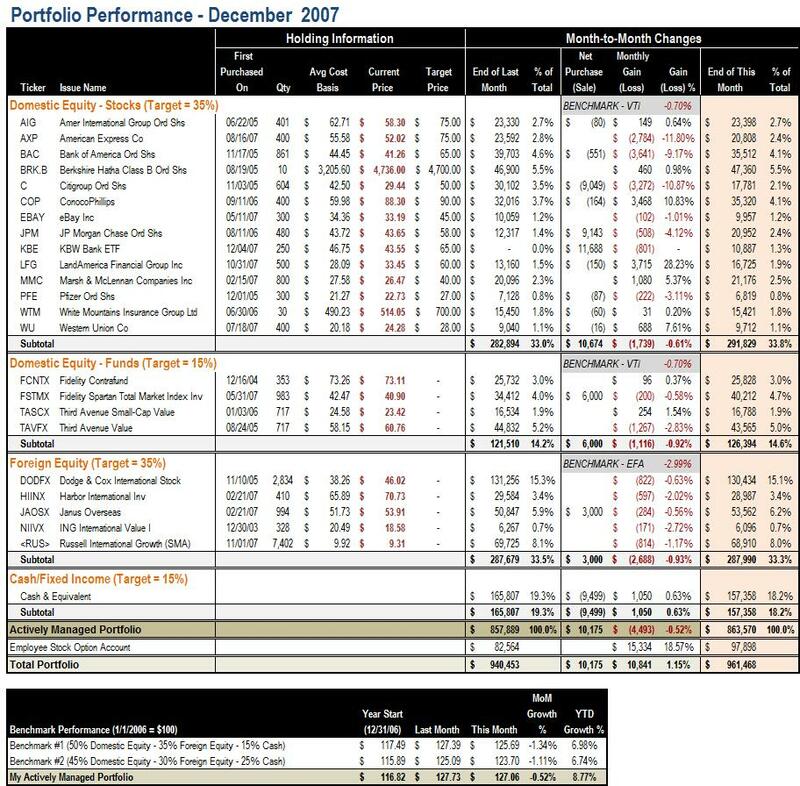 For the year of 2007, my portfolio recorded a gain of 8.77%, besting my benchmark's 6.98% gain by a good margin. 1) To book some tax loss before the end of the year, I swapped some losing Citigroup (C) shares to JP Morgan (JPM). 2) Believing the market is still undervalued in the ongoing bearish mood, I continued to add some more exposure to the market, including more to FSTMX (domestic equity), JAOSX (foreign equity) and KBE (financial stock sector ETF). Other than that, I'm gradually moving some cash balance to China to play the Dollar/Yuan carry trade, and hence you can see a higher-than-normal return on my cash account -- that includes some currency gains. 1) I intend to complete a more thorough analysis of my 2007 performance by asset class (domestic equity vs foreign equity) and by vehicle (mutual fund vs individual stocks). 2) I will then take the learning and start thinking about my 2008 asset allocation and investment strategy. This Post Has Received 450 Comments. Share Your Opinions Too. That's a pretty healthy portfolio! This coward is routing for you, but I am in nothing but government guaranteed deposits for now. I will make about a risk-free 4% return on investments over the next year. deborah: Would that 4% risk-free return include inflation as well? With inflation running at 2-4% a year (depending on the source), it's nothing to sneeze at, so you should consider that as well. I will be losing to inflation, however, I just don't trust the market. I suppose losing about 1/3rd in the tech bubble has left me very cautious and the market is simply a highly risky place to have your money right now. I think we are heading into a bear market and I would rather preserve capital and lose to inflation rather than risk having a negative return. I think negative returns are a very strong possibility for 2008. Hi! Great work on this, but one question, I don't quite follow how your Actively Managed Portfolio holdings go from 857K to 863K yet you register a loss? I understand the purchases/sales factor in to the gain/loss calc, but intuitively it doesn't jive with me. Any thoughts? Ro, there is a cash infusion of $10,175 that makes the difference. MM, sure, but where does that come from? Is it supposed to just account for salary income that isn't accrued into the net worth calc (i.e. it gets accounted for when cash comes in)? Otherwise i would assume any other cash should already be accounted for in the net worth. Ro, technically I do this by calculating any cashflow in or out of my investment accounts ... yes it won't tie to my cash position in my balance sheet. MM, mechanically i see how that works out in the ssheet, and the gain/loss makes sense. But i still don't see how you reconcile the difference in Actively Managed Portfolio value from Month-to-Month. I would think that the difference between months should be: End of This Month = End of Last Month + Gain(Loss) + Unaccrued Assets (Salary, Gifts, Inheritance, etc). What's up it's me, I am also visiting this site regularly, this website is in fact good and the visitors are actually sharing fastidious thoughts. Greetings from California! I'm bored at work so I decided to check out your website on my iphone during lunch break. I love the knowledge you provide here and can't wait to take a look when I get home. I'm amazed at how quick your blog loaded on my phone .. I'm not even using WIFI, just 3G .. Anyways, excellent blog! Hi there, all is going nicely here and ofcourse every one is sharing facts, that's genuinely good, keep up writing. I have realized that over the course of creating a relationship with real estate managers, you'll be able to get them to understand that, in most real estate contract, a payment is paid. Eventually, FSBO sellers do not "save" the commission payment. Rather, they try to win the commission by simply doing the agent's occupation. In this, they commit their money as well as time to execute, as best they might, the duties of an adviser. Those tasks include displaying the home via marketing, offering the home to all buyers, constructing a sense of buyer urgency in order to make prompt an offer, organizing home inspections, controlling qualification check ups with the lender, supervising maintenance tasks, and facilitating the closing of the deal. Thanks for your information on this blog. 1 thing I wish to say is that purchasing gadgets items from the Internet is nothing new. Actually, in the past few years alone, the marketplace for online gadgets has grown considerably. Today, you could find practically any type of electronic system and devices on the Internet, which include cameras and also camcorders to computer pieces and gambling consoles.